Not all teaching happens in the classroom. 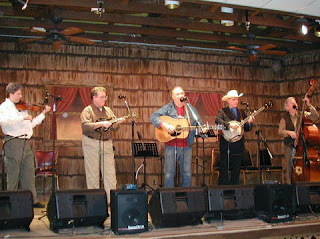 I learned a lot from the man at the center of this photo with the big old dreadnought guitar. I met him at a bluegrass festival maybe 15 years ago in Windgap, PA. Everyone was saying, "You have to go meet Jimmy Moore." I went, but I wasn't at all sure who the hell Jimmy Moore actually was. He was sitting with his camper bus, the one he said you could actually watch the gas gauge go down with every inch it moved. I was a reformed guitar player who had just started focusing on the fiddle. After all, absolutely everyone seems to know how to play the guitar, and few are crazy enough to bother with a fiddle. I sat with Jimmy, who told me, "Play it like this," and, "Kick it off it like that." He had very strong ideas about how I should play everything, and it was his way or the highway (or the next campsite, or something). He'd stop me and hum something, and I had to reproduce it until it matched the sound in his mind. It wasn't always easy, because his humming didn't sound a whole lot like a fiddle. But he was persistent, and didn't give up until he heard what he wanted. "How do you make a million dollars playing bluegrass music?" So naturally this was not a paying gig. But Jimmy Moore was the real deal, born in North Carolina (where he still kept a summer home), a great singer with perfect timing. I knew I had to play with him. On the Sunday he called a rehearsal, I was really sick with a fever. I dragged myself out of bed, drove to Jimmy's house in Marlboro NJ, anyway, and we went through his set. I went there again the following week, from where we drove in his white van to Albert Hall in Waretown, New Jersey. To this day I have no idea why he took that gig. Jimmy hated the Albert Hall. He reminded me of that for the entire hour we spent driving there (and back). "They used to give you a hot dog. A hot dog. Now, they hand you a ticket and all they give you is a cup of coffee." He had this habit of elbowing me for emphasis, and he had strong opinions about everything. Jimmy, unlike a lot of bluegrass musicians I've met, leaned left politically, had serious issues with then-President GW Bush, and had op-eds in local newspapers giving chapter and verse as to why. Fortunately, all the other gigs we did were paying, he was a lot happier, and I didn't have to feel the wrath of that elbow anymore. Jimmy didn't only write op-eds; he also wrote songs. Great songs. He wrote bluegrass songs and country songs. He won songwriting contests around the country. He had his songs recorded by various bluegrass artists, but alas, no big country hits. We'd play his songs at gigs and they were as good as the classic material with which we supplemented it. You'd be on stage and Jimmy would ask you to kick off a song you'd never played before. It didn't matter to him. He decided that's how it would be, on the spot, and that's how it was. He'd ask me to play a fiddle tune I'd never played before. I'd say hey, man, I don't really know it. It didn't matter to him. You just had to do it, and you would. How could you not? Jimmy had decided you knew it, and so you did. Jimmy ran through a whole lot of musicians over the decades he performed. I'm honored to have been one of them. I went to his memorial service on Wednesday night, full of musicians he'd influenced and with whom he'd performed. We heard from them and his children and grandchildren. One thing his granddaughter said really resonated with me. She said Jimmy had told her that if she loved what she did, she wouldn't work a day in her life. This is an idea I try to teach my students. I love my job, and I'm talking about my primary job as teacher. I love my secondary job as chapter leader, which I may or may not devote more time to than teaching. I also love my job playing fiddle, although I do it a whole lot less than I did when I wasn't chapter leader. There are just so many hours in the day, and I want to spend one or two with my family now and then. But I've never worked with a singer quite like Jimmy. He had a house full of musical instruments, and he could and would play all of them. He'd call me up and play me an instrumental he'd written on the mandolin. He'd instruct me to work out a fiddle part. He'd tell me about a CD he'd heard that I just had to hear, and I'd always find it on the net and order it, right after I got off the phone. I'm very sad I won't be getting those calls anymore. It's too bad more people didn't get to hear him. But if you want to, here's a tune he recorded a long time ago. I'm thinking the sixties, but I really don't know. This is Jimmy, giving directions as usual, in this case, to play a little bluegrass music.